The first option is reserved for special plants that are small, take more than a single season to reach a reasonable size, are plants I want to propagate, or just something that I want to have growing all winter long. There is very limited space on the growing table, so I choose carefully. The garage though, well, I can jam lots of pots and plants in there as long as I don't mind not being able to use it for vehicles all winter long. 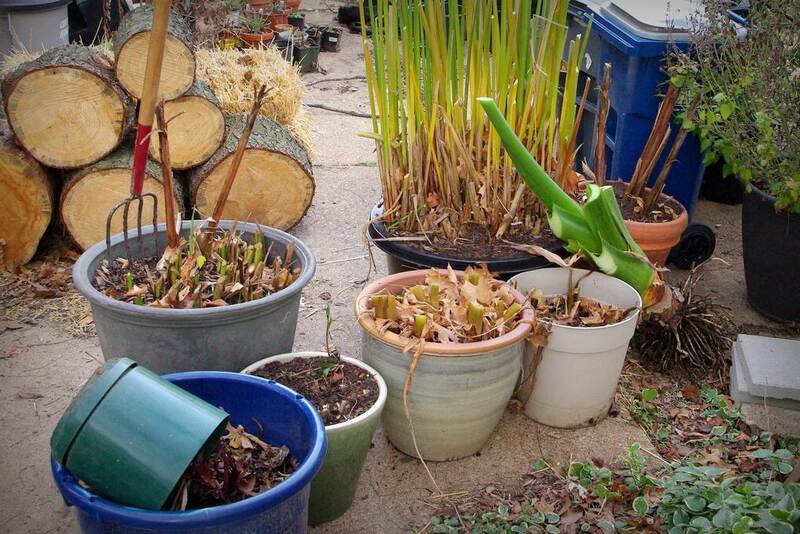 So this is my main overwintering strategy: move the pot into the garage! 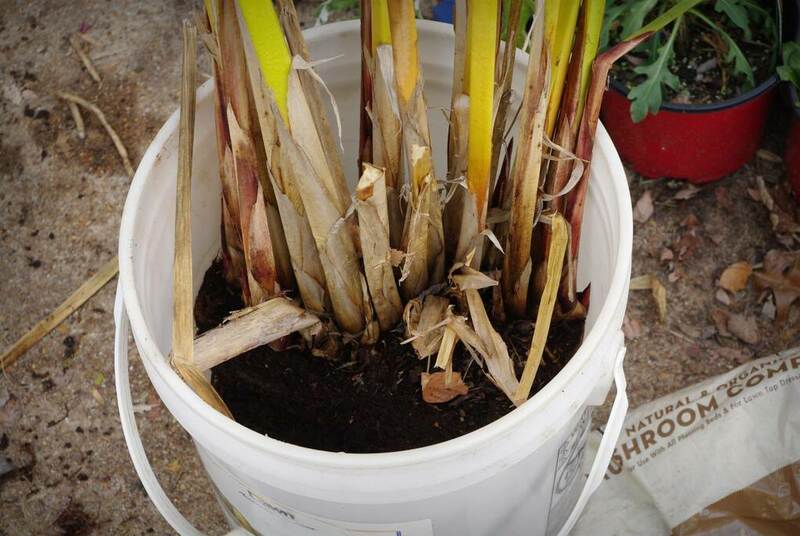 It's surprising how many plants can survive on just a little fluorescent light and a drink of water every month or so. In the cases of special varieties which I may not have too much of, I may grow a small division under the lights all winter. I like having backup plans for the unproven methods. 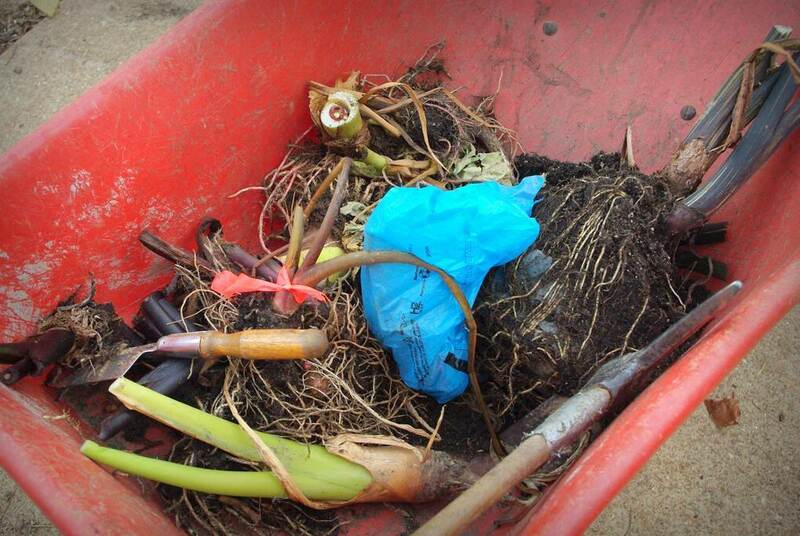 There are also cannas, which I haven't finished digging yet. 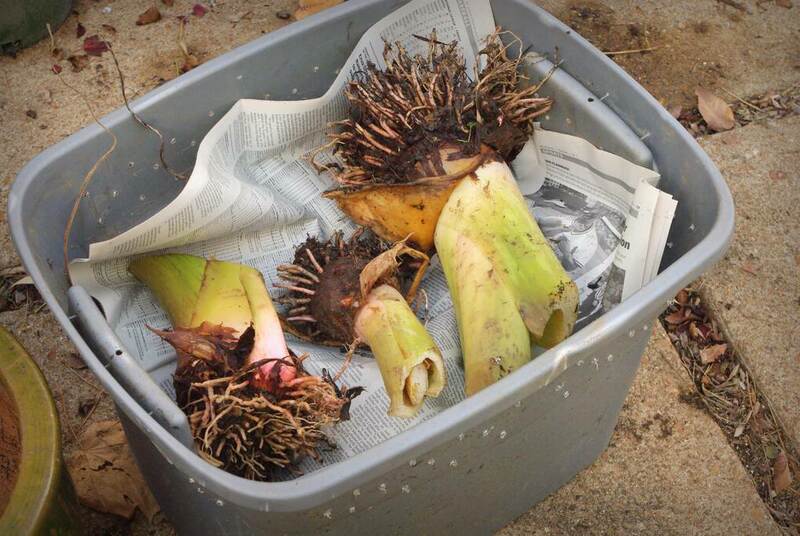 They get similar treatment as the elephant ears: some get stored as rhizomes, some stay in pots. They could all store as rhizomes, but I'd like to have a few with intact root systems to get a jump start next year and produce bigger plants. As long as it stays wet it will survive and start growing in the spring. I've tried keeping it growing under the lights and that didn't really work -- this plant is too large and the stems were too floppy. I suppose it would work if I had a room with big, south-facing windows though. The garage starts filling up pretty quickly. But this is what I go through each year to ensure I have plenty of tropical lushness when the growing season starts. It's very much worth the effort in my opinion! We're expecting another warm weekend in the 50s (our last? Who knows!) so I have to get some of this done myself! 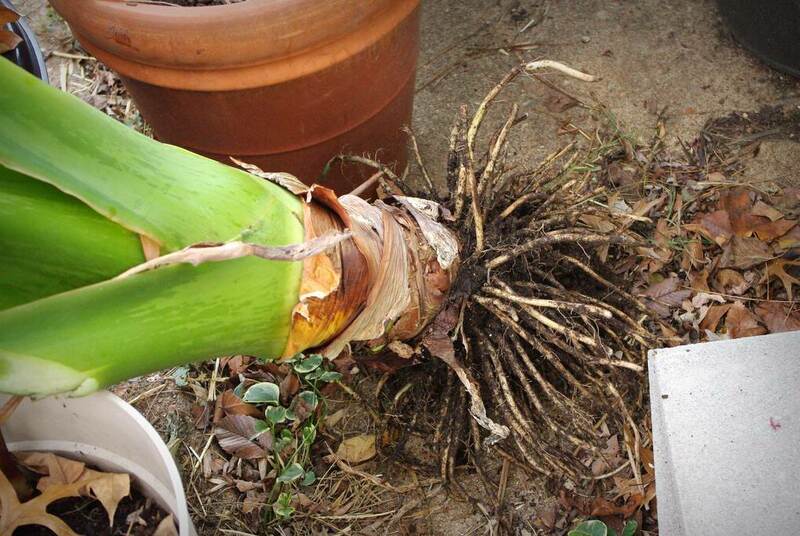 I am trying to overwinter a few of my pond plants (hibiscus, taro and dwarf papyrus) in pots in the house in soil. I've been told it will work as long as I keep them nice and moist. And so far they all look great! Something to keep me from getting too lonely for my pond over the winter! 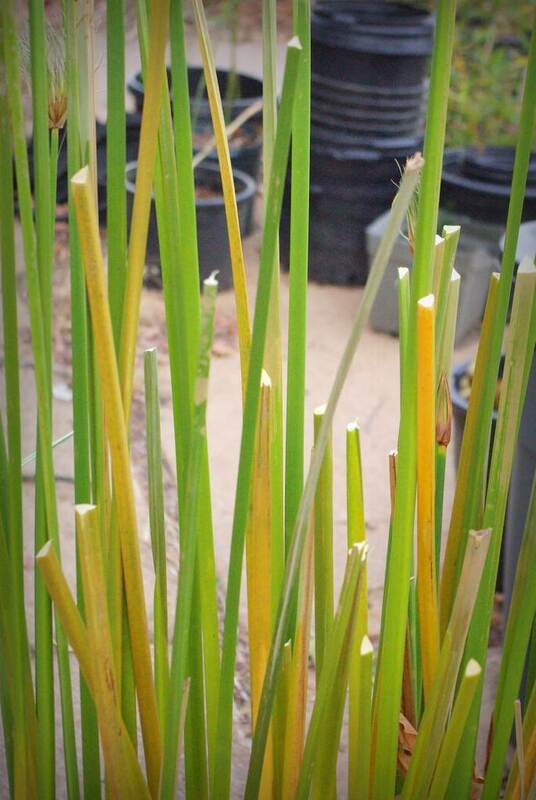 Lisa: Try dividing that dwarf papyrus, then experiment with different overwintering methods. If you have a place that stays cold but doesn't freeze (like my garage) just keeping it there for the winter should be fine. I know it's a lot of work, but it's so worth it because you'll be starting with mostly adult plants next year. I can't wait to see a photo of your garage stuffed with plants :-). I was thinking the same thing as Gerhard...photo please! Oh how I wish our garage was more than just a wooden frame. Oh to have a frost free place to store more plants! 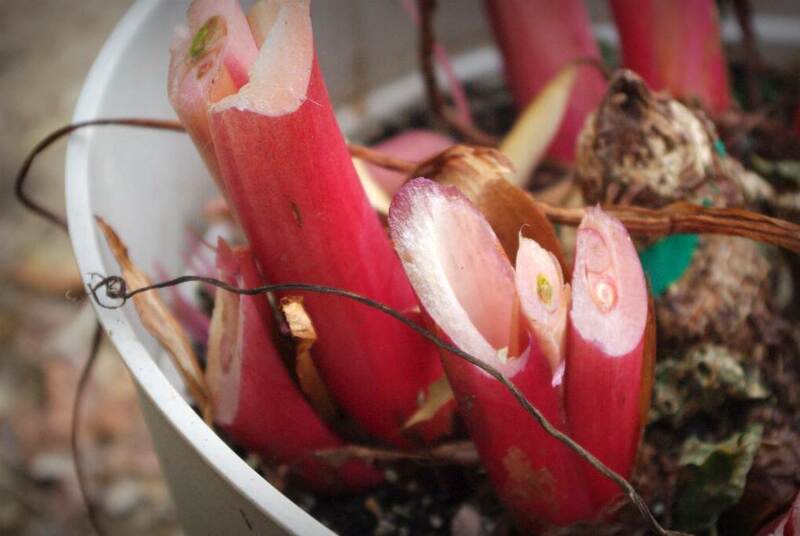 Have you ever tried over-wintering any of these straight in the ground outside? 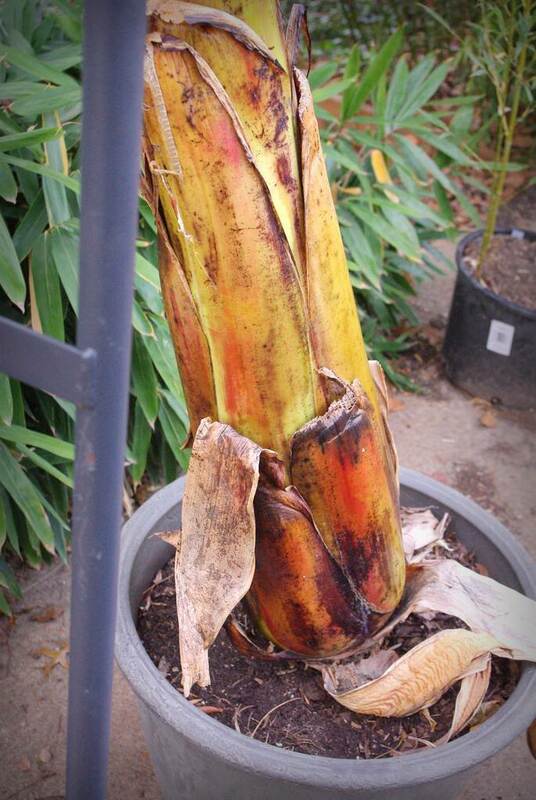 On the banana forums, I have seen someone claiming success with the over-wintering of an ensete maurelii banana plant in zone 6 which is probably very similar to the species you have in the last picture. Are you sure this is not work? Wow you do have a lot of work to get ready for winter. I think you have the same amount of work as us in 52-week gardening climates--only you have a huge amount in early spring and late fall, while ours is more spread out over the whole year. I don't know if I'd have the energy to do all that overwintering. You have my respect! When I see your garden in all its glory in spring and summer then I do agree it is totally worth all this effort!! This site is great. I've never worked with succlents, can they be over wintered in an un-heated garage (zone 5, southern Indiana)? They get light, I can lightly mist them, but can I cover them with clear bubble wrap some how. Any suggestions will be greatly appreciated. There are dozens of plants, all varieties in shallow flats. HELP PLEASE. Charlotte: what types of succulents? 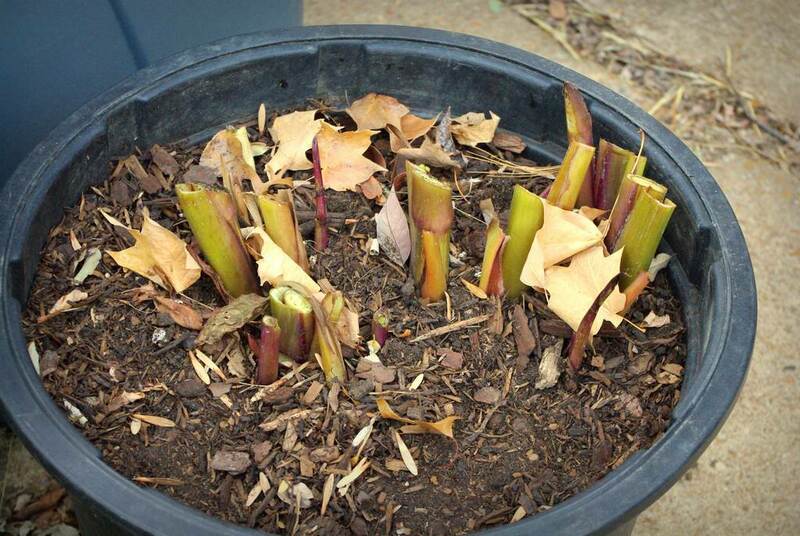 Many are cold-hardy and can take zone 5 winters if kept on the dry side, but others are tender and must be kept above freezing.